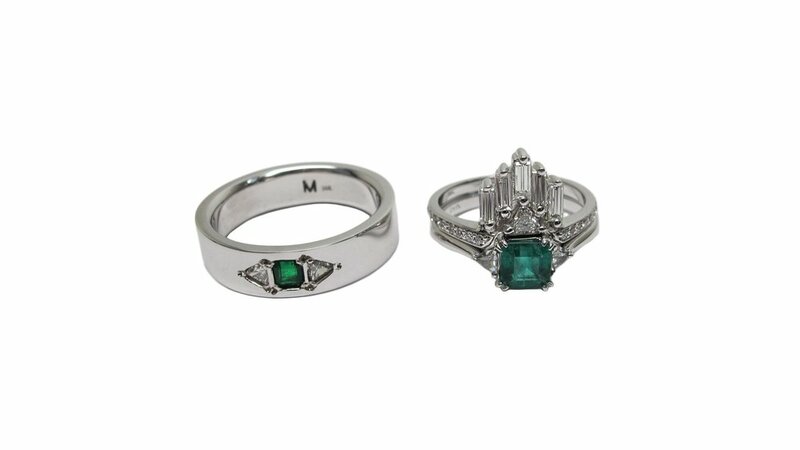 Alicia's Engagement Ring-Travis contacted us about wanting a custom art deco style engagement ring. Once we came up with the design, we sourced the emerald and the trillion diamonds for him and got started on carving the band. We kept it simple with the 3 stones and claw setting, knowing later the wedding band would be more elaborate. Alicia's Wedding Ring-A truly spectacular ring on it's own, but paired with her engagement ring we aptly call it The Emerald City. The wedding ring consisted of 5 Baguettes, 1 Trillion Diamond, and Micro Pavé diamonds on either side of the band. This just took the engagement ring to another level, like it's wearing a crown. Travis's Wedding Ring-Travis really wanted a ring that would complement Alicia's engagement ring-containing an emerald and 2 trillions, if possible. Luckily, we sourced the perfect emerald and 2 small trillion diamonds and flush set them into the hand-carved band (not an easy feat considering how fragile emeralds can be). The ring came out feeling masculine, while at the same time pairing together perfectly with Alicia's ring.